Life has been especially hectic lately with work on the townhouse (it’s coming along so beautifully – check out my IG updates here and here) the never-ending work with this house, prepping for NYFW next month. plus my dad has been in the hospital for the past 2 weeks and I’ve been flying back and forth to Phoenix to be with him. Phew! With all of that going on I’m especially thankful for a little ‘me’ time to try out new makeup. IT Cosmetics sent me a sweet holiday package with their new It Cosmetics Superhero Eye Transforming Anti-Aging Super Palette which features 12 Superhero-inspired shades. 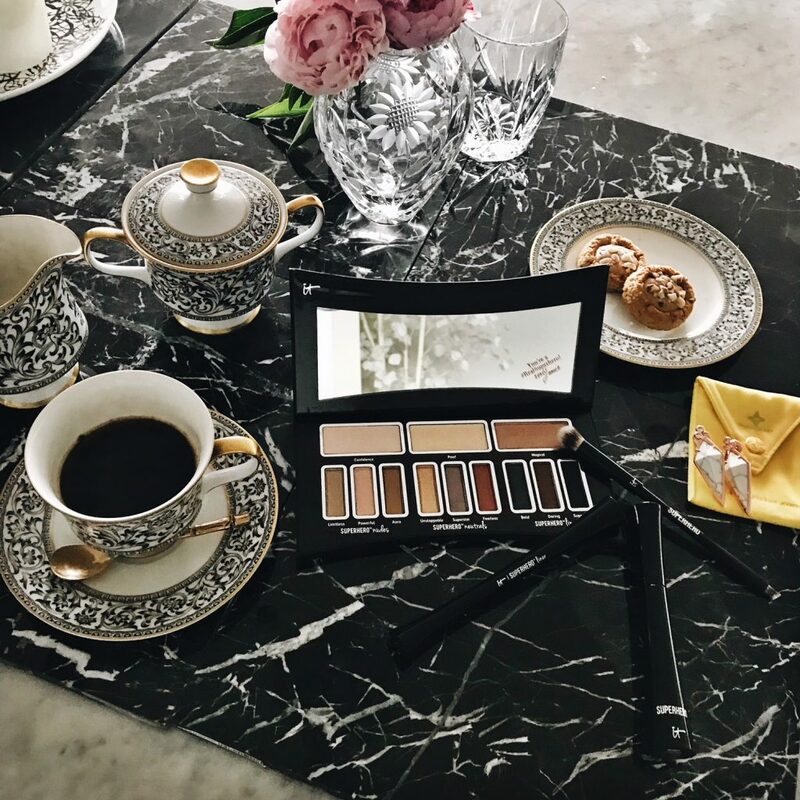 Developed with plastic surgeons, each anti-aging, ultra-luxe shadow is infused with hydrolyzed collagen, silk, peptides and antioxidants, plus innovative Superhero Pigment Power Technology for super smooth, super skin-loving, super saturated shades that last from day to night. The new It Cosmetics Heavenly Luxe Superhero Brush was also included in my holiday gift and featuring award-winning, cruelty-free Heavenly Luxe hair, this groundbreaking brush is so easy to use. This must-have, game-changing brush gives you the power to flawlessly apply all your favorite shadow and liner formulas with just one tool. The innovative dual-ended design features an angled eyeliner brush for even and precise liner application, plus a groundbreaking eyeshadow brush that starts as your all-over shadow brush – and transforms into your crease and smudger brushes. Along with the It Cosmetics Superhero Liner and It Cosmetics Superhero Elastic Stretch Volumizing Mascara they also included a pretty pair of rose gold and marble earrings from Valencia Key jewelry.